BoPET film was developed in the mid-1950s, originally by DuPont, Imperial Chemical Industries (ICI), and Hoechst. In 1955 Eastman Kodak used Mylar as a support for photographic film and called it "ESTAR Base". The very thin and tough film allowed 6,000-foot (1,800 m) reels to be exposed on long-range U-2 reconnaissance flights. In 1964, NASA launched Echo II, a 40-metre (131 ft) diameter balloon constructed from a 9-micrometre (0.00035 in) thick mylar film sandwiched between two layers of 4.5-micrometre (0.00018 in) thick aluminum foil bonded together. The manufacturing process begins with a film of molten polyethylene terephthalate (PET) being extruded onto a chill roll, which quenches it into the amorphous state. It is then biaxially oriented by drawing. The most common way of doing this is the sequential process, in which the film is first drawn in the machine direction using heated rollers and subsequently drawn in the transverse direction, i.e. orthogonally to the direction of travel, in a heated oven. It is also possible to draw the film in both directions simultaneously, although the equipment required for this is somewhat more elaborate. Draw ratios are typically around 3 to 4 in each direction. Once the drawing is completed, the film is "heat set" or crystallized under tension in the oven at temperatures typically above 200 °C (392 °F). The heat setting step prevents the film from shrinking back to its original unstretched shape and locks in the molecular orientation in the film plane. The orientation of the polymer chains is responsible for the high strength and stiffness of biaxially oriented PET film, which has a typical Young's modulus of about 4 GPa (0.58×10^6 psi). Another important consequence of the molecular orientation is that it induces the formation of many crystal nuclei. The crystallites that grow rapidly reach the boundary of the neighboring crystallite and remain smaller than the wavelength of visible light. As a result, biaxially oriented PET film has excellent clarity, despite its semicrystalline structure. If it were produced without any additives, the surface of the film would be so smooth that layers would adhere strongly to one another when the film is wound up, similar to the sticking of clean glass plates when stacked. To make handling possible, microscopic inert inorganic particles are usually embedded in the PET to roughen the surface of the film such as silicon dioxide. Biaxially oriented PET film can be metallized by vapor deposition of a thin film of evaporated aluminium, gold, or other metal onto it. The result is much less permeable to gases (important in food packaging) and reflects up to 99% of light, including much of the infrared spectrum. For some applications like food packaging, the aluminized boPET film can be laminated with a layer of polyethylene, which provides sealability and improves puncture resistance. The polyethylene side of such a laminate appears dull and the PET side shiny. Other coatings, such as conductive indium tin oxide (ITO), can be applied to boPET film by sputter deposition. Laminates containing metallized boPET foil (In technical language called printin or laminate web substrate) protect food against oxidation and aroma loss, achieving long shelf life. Examples are coffee "foil" packaging and pouches for convenience foods. White boPET web substrate is used as lidding for dairy goods such as yogurt. Clear boPET web substrate is used as lidding for fresh or frozen ready meals. Due to its excellent heat resistance, it can remain on the package during microwave or oven heating. Metallized boPET is used as a mirror-like decorative surface on some book covers, T-shirts, and other flexible cloths. boPET film is used in bagging comic books, in order to best protect them during storage from environmental conditions (moisture, heat, and cold) that would otherwise cause paper to slowly deteriorate over time. This material is used for archival quality storage of documents by the Library of Congress (specifically Mylar® type D) and several major library comic book research collections, including the Comic Art Collection at Michigan State University. While boPET is widely (and effectively) used in this archival sense, it is not immune to the effects of fire and heat and could potentially melt, depending on the intensity of the heat source, causing further damage to the encased item. Similarly, trading card decks (such as Pokémon, Magic: The Gathering, and Yu-Gi-Oh!) are packaged in pouches or sleeves made of metallized boPET. It can also be used to make the holographic artwork featured on some cards, typically known as "holos", "foils", or "holofoils". For protecting the spine of important documents, such as medical records. Five layers of metallized boPET film in NASA's spacesuits make them radiation resistant and help regulate temperature. Metallized boPET film emergency blankets conserve a shock victim's body heat. As a thin strip to form an airtight seal between the control surfaces and adjacent structure of aircraft, especially gliders. Light insulation for indoor gardening. Fire shelters, used by wildland firefighters. Aluminized proximity suits used by fire fighters for protection from the high amount of heat release from fuel fires. Metallized boPET solar curtains reflect sunlight and heat away from windows. Aluminized, as an inexpensive solar eclipse viewer, although care must be taken, because invisible fissures can form in the metal film, reducing its effectiveness. Amateur and professional visual and telescopic solar filters. BoPET films are often annealed to a glass element to improve thermal conductivity, and guarantee the necessary flat surface needed for even telescopic solar observation. Manufacturers will typically use films with thicknesses of 280–500 micrometres (0.011–0.020 in), in order to give the films better resilience. 250-micrometre (0.0098 in) thickness films with a heavy aluminium coating are generally preferred for naked-eye Solar observation during eclipses. Films in annular ring mounts on gas-tight cells, will readily deform into spherical mirrors. Photomultiplier cosmic-ray observatories often make use of these mirrors for inexpensive large (1.0 m and above), lightweight mirror surfaces for sky-sector low and medium energy cosmic ray research. As a light diaphragm material separating gases in hypersonic shock and expansion tube facilities. As a beamsplitter in Fourier transform infrared spectroscopy, typically with laser applications. Film thicknesses are often in the 500 micrometre range. Insulating material for a cryocooler radiation shield. As a window material to confine gas in detectors and targets in nuclear physics. In CT scanners it acts as a physical barrier between the xray-tube, detector ring and the patient allowing negligible attenuation of the xray beam when active. 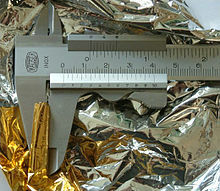 Spacecraft are insulated with a metallized BoPET film. The material for solar sails of spacecraft. Carrier for flexible printed circuits. boPET film is often used as the diaphragm material in headphones, electrostatic loudspeakers and microphones. boPET film has been used in the production of banjo & drumheads since 1958 due to its durability and acoustical properties when stretched over the bearing edge of the drum. They are made in single- and double-ply versions, with each ply being 2–10 mils (0.051–0.254 mm) in thickness, with a transparent or opaque surface, originally used by the company Evans. boPET film is used as the substrate in practically all magnetic recording tapes and floppy disks. Metallized boPET film, along with other plastic films, is used as a dielectric in foil capacitors. Clear boPET bags are used as packaging for audio media such as compact discs and vinyl records. Clear and white boPET films are used as core layers and overlays in Smart Cards. Before the widespread adoption of CAD, engineering drawings or architectural drawings were plotted onto sheets of boPET film, known as drafting film. The boPET sheets become legal documents from which copies or blueprints are made. boPET sheets are more durable and can withstand more handling than bond paper. Although "blueprint" duplication has fallen out of use, mylar is still used for its archival properties, typically as a record set of plans for building departments to keep on file. Overhead transparency film for photocopiers or laser printers (boPET film withstands the high heat). In theatre effects as confetti. On farmland and domestic gardens, highly reflective aluminized PET film ribbons are used to keep birds away from plants. Used in dentistry when restoring teeth with composite. In nail polish, as a coloured and finely shredded additive to create a glitter effect. ^ Mark T. DeMeuse (2011). Biaxial Stretching of Film: Principles And Applications. Elsevier. p. 48. Izard, Emmette Farr, "Production of polyethylene terephthalate", U.S. patent no. 2,534,028 (filed: 1948 May 13; issued: 1950 December 12). Adams, John Francis Edward; Gerber, Kenneth George; Holmes-Walker, William Anthony, "Process for the production of biaxially oriented polyethylene terephthalate film", U.S. patent no. 3,177,277 (filed: 1957 May 10 ; issued: 1965 April 6). ^ "Kodak HCF Film/ESTAR Base" (PDF). www.kodak.com. Eastman Kodak Company. April 2015. Retrieved 2018-08-24. ^ Eyes in the Sky, Dino A. Brugioni 2010, Naval Institute Press, ISBN 978 1 59114 082 5, pp. 102, 115. ^ Staugaitis, C. & Kobren, L. "Mechanical And Physical Properties of the Echo II Metal-Polymer Laminate (NASA TN D-3409)", NASA Goddard Space Flight Center (1966). ^ "Process Flow". Ampef.com. Retrieved 2018-08-24. ^ Thiel, Ulrich. "Polyester Additives" (PDF). Dr. Thiele Polyester Technology. Retrieved 4 January 2019. ^ "What is Mylar Paper - More Than Just Decoration". Jampaper.com. Retrieved 2015-07-02. ^ Scott, Randall W. (1998). "A Practicing Comic-Book Librarian Surveys His Collection and Craft". Serials Review. 24 (1): 49–56. ^ "Albany library's entire collection exposed to smoke | Athens County Public Libraries". Myacpl.org. 2008-06-17. Retrieved 2015-07-02. History of Polymers & Plastics for Teachers. by The American Chemistry Council (HTML format) or (PDF format) - 1.9MB, which includes the "chasing arrow" recycling symbols (PET is #1) and a description of plastics. An interesting toy has been developed using boPET and a stick-shaped Van de Graaff generator.